The smartphone is perhaps the most important piece of technology for modern life. Without it you would probably be lost and disconnected from the rest of the world. But what’s the most important element to a smartphone? Some may argue that it’s the processor, or the screen, or even battery life, but given the role social media plays in this digital age, the camera is perhaps the most crucial aspect to a great smartphone experience. More than that having a great camera not only makes it easier to capture those significant moments in your life, it also ensures that the best quality pics are shared with the people who matter most to you. To that end let’s look at some of the great smartphone options that Samsung has, and the highly specced cameras that they have onboard. We start things off with perhaps the best value for money smartphone that Samsung has in its ranks right now – the Galaxy A7. The Galaxy A range has always been noteworthy for bringing great specs into a stylish package, and the Galaxy A7 takes things a step further thanks to its camera setup. More specifically it has a trio of lenses on the rear to ensure those special moments never escape you. Looking on the back there’s a 24MP, 8MP and 5MP lens at work here, with the latter two handling ultra wide-angle and depth sensing respectively. The aforementioned 24MP option has a wider field of view than most, which lends itself well to shooting outdoors in nature or taking snaps of interesting architecture. Should you wish to get even more detail into the images, the ultra wide-angle lens takes care of things, and the depth sensing is particularly handy while doing portrait photography and aiming for the highly coveted bokeh effect. If three cameras seems a little excessive to you, perhaps two is more your pace. Samsung has plenty of options wielding a dual camera system on the rear too, and one of the latest models is the Galaxy J6+. As for the lenses in question, a 13MP and 5MP is found on the J6+. These lenses work in a very similar fashion to the A7. The larger 13MP camera will be used for taking the majority of your pics, and also has a wide-angle functionality to get more into the viewfinder. As for the 5MP lens it’s a depth sensing one and is once again great for portraits. Should selfies be more your pace, the J6+ is fitted with a 8MP camera up front to ensure the images always comes crisp and clear, even in low light conditions. Priced a bracket below the Galaxy A7, the J6+ may not sport as impressive specs, but is certainly solid in every respect. Add to that a good camera performance, and it ticks all the necessary boxes. With most of Samsung’s current smartphone offerings serving up a dual lens or greater camera experience, there are a number of good options out there to meet all types of budgets. 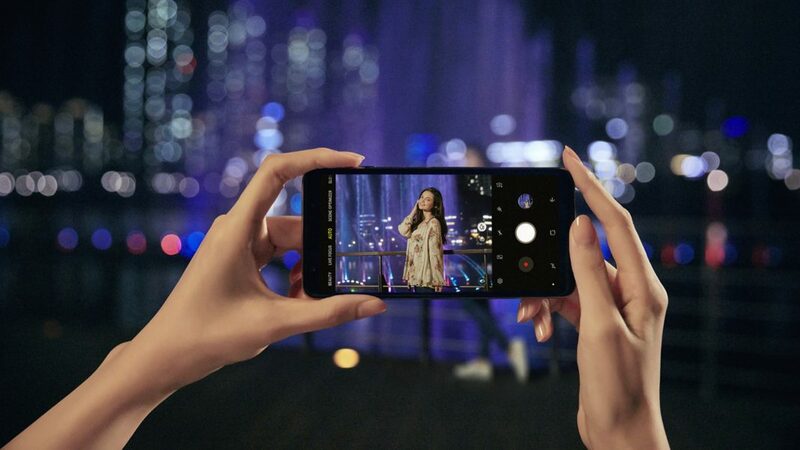 Consequently if you’re looking for a smartphone with a great camera, as this has become the most important aspect of any mobile device, Samsung has options a plenty. To find out more about Samsung’s range of great camera-sporting smartphones, head here.